Sea-level rise could swamp thousands of homes in the San Francisco Bay Area, most in Silicon Valley and Marin, within 30 years. 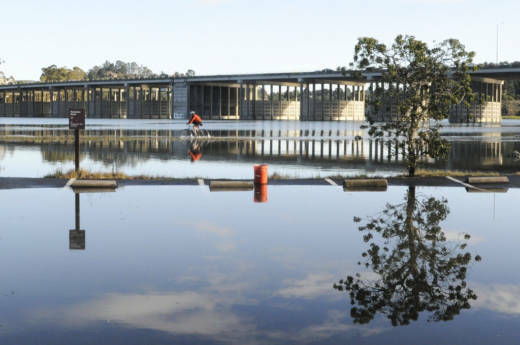 A new study from the Union of Concerned Scientists, relying on federal government projections for climate change, found that more than 20,000 homes across California would chronically flood by 2045. That is about a mortgage-length’s-time from now. UCS climate scientist Kristy Dahl, an author of the new report, says she noticed that the Bay Area homes most vulnerable to rising seas are in San Mateo, Santa Clara, and Marin counties. These are suburbs where people have typically moved to feel safe, says Dahl. “The very suburbs people flocked to because they were affordable, you know we think of as being kind of safe havens,” Dahl says. In one East Palo Alto zip code, more than a quarter of houses could see chronic inundation, on 26 or more days a year. “That’s on par for example with the number of homes that are at risk in Key West Florida,” Dahl says. Dahl says one conclusion is that coastal property in the Bay Area is overvalued. The Bay Area's sea-level related risks aren't limited to homes. Critical communal assets like power plants, water treatment plants, transit stations, highways and airports line the shoreline. Previous regional studies estimate, if a freeway floods five times as many people as the affected homeowners will feel the pain. Local counties say they’re aware of these risks — and they’re now starting to plan for them. Marin County will consider spending on climate change planning as part of its budget process this week. And in San Mateo County, supervisors next week will consider whether to spend $429,500 of state money on climate vulnerability assessments over the next fiscal year.